Johns’ company, Native Renewables, promotes low-cost clean energy solutions for Native American families throughout the U.S., with an emphasis on job creation and on benefiting the community as a whole. The trailers were built by members of the Navajo nation and were financed by Empowered by Light and Give Power. The construction of the “black snake” marks the conglomeration of corporate/banking interests being elevated above that of the public interest. Furthermore, the ongoing construction has already desecrated sacred burial sites and cultural artifacts. Imagine how you would respond if an oil pipeline was being dug through the cemetery where your grandparents and great grandparents were buried. 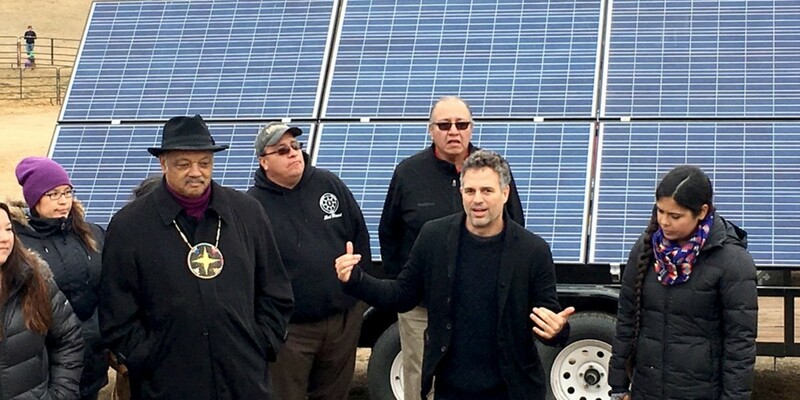 Mark Ruffalo taking a stand for the Standing Rock Sioux is a great example for all individuals, celebrity, and non-celebrity alike. Rather than simply donating some money to a cause, he has utilized his celebrity to bring much greater attention to the continued injustices being perpetrated against the Native American community.